San Francisco must win its final game against Rams to improve its postseason chances. 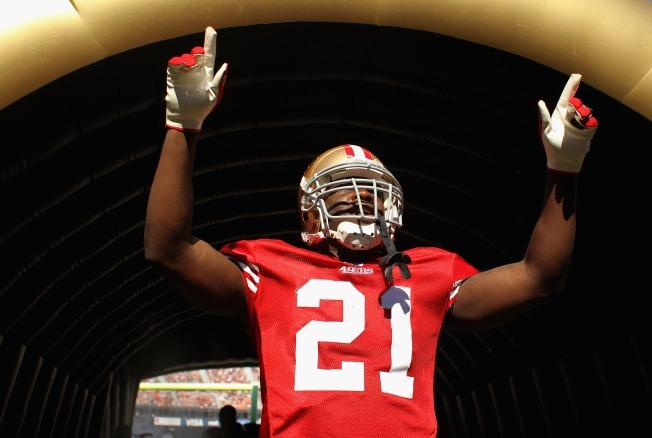 Frank Gore says the 49ers have no room to rest heading into the playoffs. Frank Gore planned to openly cheer for the Falcons on Monday night against New Orleans. Coach Jim Harbaugh and the rest of the San Francisco 49ers? You bet they had the same idea. The Saints beat Atlanta 45-16 to clinch the NFC South title, keeping the 49ers from securing the NFC's No. 2 seed and a playoff bye. "If they don't win, if New Orleans don't lose, we'll go down to St. Louis and try to get a win and lock up that second seed and get that bye week," Gore said earlier Monday. "As a team, that will help us, especially playing at home. Our first (playoff) game, that's big for us. I'm excited." A loss by the Saints would have wrapped up the second spot for Gore and the NFC West champion Niners (12-3), and take the pressure off Sunday's season finale at St. Louis. Resurgent San Francisco has put itself in about the best possible position heading into the franchise's first playoff appearance in nine years. "Hoping for the best, expecting the worst," Harbaugh said of getting help from Atlanta. "Regardless, preparing to beat the Rams." The 49ers pulled off an impressive 19-17 victory at Seattle on Saturday behind David Akers' four field goals, which put him at 42 for the year to set the NFL's single-season record. Punter Andy Lee had his punt blocked midway through the fourth quarter in a rare special teams mistake that very well could have been a turning point and momentum shift for the Seahawks. It was Lee's first blocked punt since 2008 and third in an eight-year career that could include a third Pro Bowl selection Tuesday. "Probably the biggest factor is they didn't flinch," Harbaugh said. "Even after the blocked punt the demeanour on the sideline was outstanding — offense, defense, special teams, nobody was hanging their daubers." The 49ers were closely monitoring what happened to the Saints, whose Drew Brees set the NFL record for yards passing in a season. San Francisco holds the tiebreaker with New Orleans if both were to finish at 13-3 or 12-4. "Oh, in tune, in tune," Harbaugh said of the implications of Monday night's result. It might affect how much he uses his starters and regulars against the lowly Rams (2-13) on Sunday, too. If Harbaugh wins at St. Louis, he would finish up his first year with the franchise's second-best record by a rookie NFL coach behind George Seifert's 14-2 showing in 1989. A sixth road win also would match the team's total of such victories from 2008-2010. Harbaugh praised Michael Crabtree for his late, leaping 41-yard catch in traffic that set up Akers' final field goal, a go-ahead shot from 39 yards with 2:57 left that helped seal the win. "In a lot of ways, Crab saved Christmas," Harbaugh said. "David Akers, in that mix, made it a little merrier." For anyone who questioned Crabtree's contact with Seattle cornerback Brandon Browner on the play, Harbaugh emphatically made his point two days later: "Clean play. Any comment that it was not is baloney — full of baloney, bunch of baloney." Harbaugh's 49ers have faced what they considered must-win games in recent weeks to stay in contention for the NFC's second seed. They have handled the pressure of prime time in a commanding 20-3 Monday night win against the Steelers last week that featured two power outages and delays, Then they dealt with a hostile Seattle environment only five days later. "That's good," Gore said. "That's like the playoffs. If you want to go to the next round, you've got to win." San Francisco is 5-2 on the road this season, coming from behind to earn four of those victories — something the team couldn't do during its playoff drought. This marks the team's most success and wins away from Candlestick Park since the last playoff season in 2002, with the team going 14-50 on the road over the previous eight years, 1-7 last season under coach Mike Singletary, who was replaced by Harbaugh this year. The 12 total victories also are the most since the 2001 group finished 12-4. "The biggest thing I'd point to are a lot of the little reasons that a lot people think are the minutiae that aren't important that add up to make all the difference," Harbaugh said. "And our guys continually do the little things and they stack on each other and they build on each other and, lo and behold, you win games in high-pressure situations. Find ways to do enough things right to win games. And get better. Those things lead to wins and enough of those wins lead to championships." Gore, for one, isn't thinking ahead to a possible NFC showdown with defending Super Bowl champion Green Bay down the road. He is among a handful of key veterans making their first post-season appearances next month. "I'm going in feeling real good, ready to play," Gore said. "We ain't worried about no Packers right now."